7/25 Cup of Coffee: Boston's top prospect made his return to the Portland lineup as part of a big day on the farm. Michael Chavis (pictured, left) drove in what proved to be the winning run in support of an excellent Mike Shawaryn performance for the Sea Dogs. Pawtucket veterans Dan Butler and William Cuevas helped knock off an old friend at McCoy. 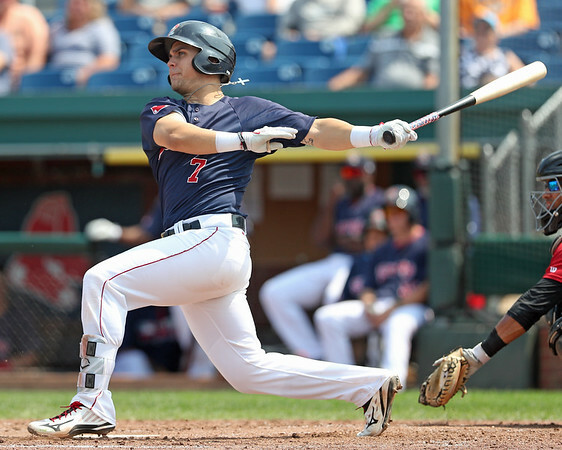 Jerry Downs hit a pair of homers in Salem's loss, while Jarren Duran and Nicholas Northcut continue to rake for Lowell and the GCL Sox. The PawSox got the best of a former Boston farmhand. Ten years after the Red Sox made Stephen Fife their third-round pick, he made his first appearance on McCoy Stadium's mound, four organizations and 18 major league appearances later. It was Fife's old battery mate Dan Butler who touched him for a solo home run in the fourth, one of five runs the PawSox reached him for. William Cuevas struck out nine in 6 2/3 innings, walking two and allowing two runs on five hits. 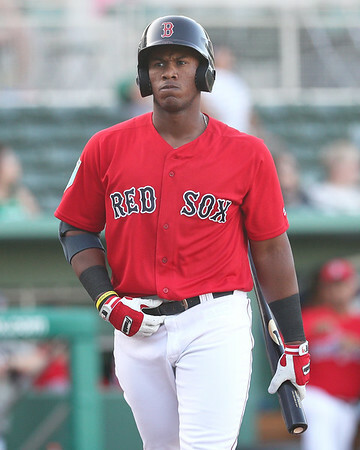 Rusney Castillo doubled as part of a 2-for-3 evening, and a resurgent Sam Travis had two hits and an RBI to run his hitting streak to seven games. Michael Chavis returned to the Portland lineup after a sore wrist sidelined him for 10 days, and the system's top prospect keyed the victory. The first-inning double by Chavis plated Danny Mars, which was all the support Mike Shawaryn and the Portland staff needed. Shawaryn was dominant, scattering five hits across seven shutout innings. He struck out four, walked two, and needed only 88 pitches to complete those seven frames. Travis Lakins and Trevor Kelley had matching lines, each pitching a scoreless inning of relief with one hit and one strikeout. Coming off a string of outstanding starts, Darwinzon Hernandez saw his control abandon him Tuesday. The lefty walked six batters in five innings, surrendering three runs and striking out five. Despite the uneven start, Hernandez sports a nifty 1.35 ERA in five July starts, with 35 strikeouts in 26 2/3. Salem fell short despite a 13-hit attack that featured a pair of home runs by first baseman Jerry Downs (pictured, right). A solo shot in the second and a two-run blast in the ninth gives Downs nine homers on the year. Michael Osinski added a pair of doubles, while Roldani Baldwin and Victor Acosta had one apiece as part of their respective two-hit evenings. The second game of Greenville's four-game set with Hickory was called due to rain and unplayable grounds. The two squads will try again on Wednesday, with a doubleheader scheduled for 4:30 pm. Jarren Duran continues to be the catalyst at the top of the Spinners' order. The center fielder was 2 for 4 with a double and a pair of RBI, extending his hitting streak to seven games and raising his average to a robust .357. Kole Cottam added a pair of hits, and Devlin Granberg reached base three times with a single and two walks. Brian Brown turned in a strong start, allowing a run on four hits in four innings, striking out three. Taylor Ahearn got the win with three hitless innings of relief. Ahearn struck out three and walked one. It's been an outstanding July for 11th-round draft pick Nicholas Northcut, and he added to it on Tuesday afternoon with his first professional homer. Northcut also singled and walked twice, raising his July line to .422/.527/.644. Juan Carlos Abreu, a 2016 draftee, also hit his first homer as a pro in the 91st game of his career. Caleb Ramsey broke out of a brutal 1-for-33 slump to begin his career with a 2-for-4 afternoon that included a double and an RBI. Starter Edilson Batista fired five shutout innings, giving up four hits and striking out three against one walk. Rehabbing righty Zach Schellenger turned in a fourth consecutive scoreless outing, striking out one. The Sox fell despite a big effort at the plate by Carlos Sanchez. Sanchez homered, doubled, and scored two runs on the day. Breiner Licona doubled and walked, giving him four extra-base hits in his first seven games and raising his slash line to .316/.409/.632. In proper Domincan Summer League fashion, the Sox game-winning rally in the bottom of the ninth did not include a base hit. Ronaldo Pulgar walked to lead off the inning, the third time Pulgar had reached via the free pass on the day. He advanced to second on a force out, and then to third on an errant pickoff attempt. Kleiber Rodriguez then drove him home with a sacrifice fly. Earlier in the contest, Rodriguez picked up a pair of hits and scored a run. Player of the Day: There were several notable performances worthy of note on Tuesday, but the nod goes to Salem first baseman Jerry Downs. Downs, a steady force in the middle of the Sox lineup all season, delivered his second multi-homer game of the season. His nine homers on the year represent a career high for the 2015 draftee and rank him second on the Salem squad behind Bobby Dalbec.